Click on RESOURCES for everything you need to know about climbing Kilimanjaro. Click on RESOURCES for everything you need to know to prepare for Safari. Click on RESOURCES for everything you need to know to prepare for Zanzibar. Click on RESOURCES for everything you need to know for an Active Eco-Adventure in Tanzania. …to discuss your own African adventure! 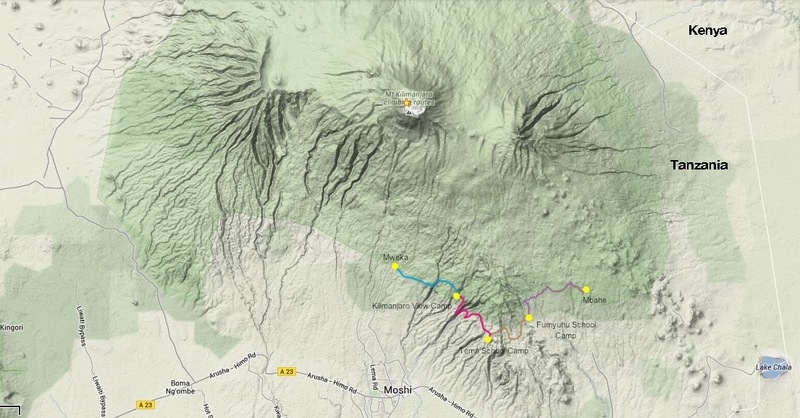 Enough hiking days for an expedition deep into the heart of the Chagga villages on Kilimanjaro. We walk 7 – 22 kilometers per day on mountain trails between 1400 and 2200 meters elevation. The walking is strenuous on steep trails that can be slippery when wet. The route includes some challenging hiking as there are many ridges and valleys, but your guide will set a slow pace appropriate for your group. Trekking poles strongly recommended. Overnights are spent in our comfortable camp with spacious walk-in tents for 1-2 people or families, and locally-inspired meals served in a dining tent and prepared by our expert mountain cooks. Day 1: Mweka to Wondo. Hiking distance: 4.9mi / 8km. Day 2: Wondo to Tema. Hiking distance: 4.3mi / 7km. Day 3: Tema to Kidia. Hiking distance: 5.6mi / 9km. Day 4: Kidia to Mbahe Village. Hiking distance: 13.6mi / 22km. Morning pick-up from your hotel and vehicle transfer to the trailhead. We begin on a low trail used by villagers to access their fields, passing through villages and into the forest. We cross many rivers on small wood bridges or rock to rock to reach the other side. We will encounter the traditional irrigation channels, used by local farmers for more than 100 years, to grow coffee, bananas and other fruits and vegetables. After 5km and a walk along the channels of the Rau river valley, we come upon a high waterfall. Save some energy as the last ascent to camp will be demanding! Hiking distance: 4.9mi / 8km. knowledge of the mountain on which he grew up. Our campsite at a primary school overlooks Moshi Town and the surrounding plain. Hiking distance: 4.3mi / 7km. After a night camped at 1900 meters, the trail proceeds through more colorful mountain villages, past coffee and maize farms and rivers where you can refresh in the cool and crystal clear water. We pass Kidia village, the site of the first European settlement in the Kilimanjaro region. There are many large Catholic and Lutheran churches on the mountain, each with its own story of missionary work among the Chagga people. Our last camp is at another primary school high up the mountain. Hiking distance: 5.6mi / 9km. Our last day is a perfect day to savor the landscape. The route is longer than the other days but the trails are gentler! We reach several superb viewpoints down over Moshi, and also up toward the summit of Mount Kilimanjaro, which emerges as we approach Mbahe Village and Simon Mtuy’s family farm. Stay the night at SENE’s Mbahe Farm Cottages. Nestled among the lush tropical forests near the border of Kilimanjaro National Park, the farm consists of 15 acres of land on which Simon Mtuy’s ancestors raised cattle and today is used as a small ecologically sustainable farm with 8 semi-detached guest rooms. Hiking distance: 13.6mi / 22km. Rest, recover, and relax at Mbahe Farm House. Enjoy delicious “homebrew” coffee, grown and roasted on the farm, meals made with fresh fruits and vegetables from the garden, and perhaps take a refreshing swim below the Moonjo River waterfall that sits on the property. It is the perfect spot to relax after your adventure walk on Kilimanjaro! For those returning home you will be transferred to the Kilimanjaro International Airport to catch your flight. Those staying in Tanzania will start your next adventure today. Tips and gratuities to leaders, guides, crew, or other staff; cold drinks and alcohol; additional accommodations and meals made necessary by airline schedule changes, inability to complete the climb, or other factors; pre-trip expenses such as immunizations, travel insurance, passports, and visas; international airfare; airport departure taxes; and any expenses of a personal nature such as souvenirs and laundry. Trip prices are based on SENE costs, fees, and supplier prices in effect at the time of booking. SENE reserves the right to alter trip prices should inflation, cost of fuel, labor, materials, or exchange rates change. If the Tanzania National Parks Authority (TANAPA) raises park fees, or any hotel, lodge, camp, airline, or any other service provider raises their rates, SENE reserves the right to require additional payment from the client.